I was planning on doing a tutorial on how to make this lovely crib skirt, but I ended up going into labor just after I started making it. I wanted to be really sure it was true labor before I went to the hospital, so I kept working away on this project, pausing every 10 minutes, 7 minutes, 5 minutes to grab the table, white-knuckled and try not to scream my head off. So sufficient to say, I did not take any pictures of the process. But I'll try to walk you through the construction nonetheless. So basically a crib skirt is made up of a deck and three panels (I didn't make one for the 4th side since it would be up against a wall and you wouldn't see it anyway). The deck is just a measurement of the crib mattress size, which is a standard 28" x 52". 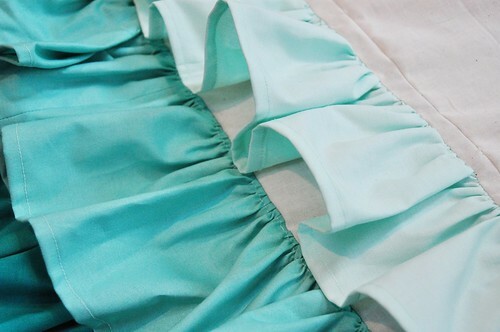 The side panels are the length of the side and then the measurement of where you want the skirt to hit the floor. With this crib skirt, I left it hanging a good 6 inches or so off of the floor. That way when the crib mattress is lowered when Penelope gets older, it will just brush the floor as opposed to puddling in a crinkled mess. I ended up using exactly one yard of each fabric for the ruffles. I cut the bottom two colors into 6 inch tall strips and the top color into 5 inch tall strips (this makes all of the ruffles appear the same size since there is about one inch of overlap on the bottom two ruffles). To get a full ruffle-y effect I cut my strips 2 1/2 times as long as each panel. So for the short sides, my strips were 70" and the long front panel strips were 130". Hem the two short ends and one of the long sides. Then I simply ruffled the strips by sewing a long basting stitch along the unhemmed side and gathering the fabric until it was the length of the panel, pinned it down like crazy, and sewed it to the panel. For the topmost strips, I sewed them to the panels - wrong sides facing - so that the raw edges would not be exposed, but for the middle and bottom strips, I simply laid them so they were laying right side up because the raw edges would be covered by the ruffle from above. I didn't even bother to remove my gathering stitches since they won't be seen anyways. Then I sewed the panels to the deck. Now since you've tackled the crib skirt, you can go on to make one of those fancy shower curtains from Anthropologie. But probably not for awhile. You'll be super sick of ruffling. I love this! 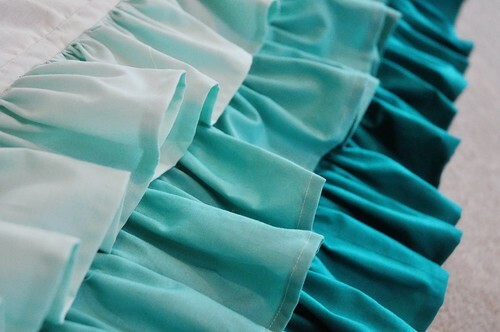 I love the girly ruffles and the fact that the colours are not overly girly, just perfect! That's SO cute! When I first saw this I assumed you had used a gathering foot on your sewing machine or serger, but good for you for doing all that gathering the labour-intensive way (so to speak?!?). Beautiful! SO BEAUTIFUL! And you're an amazing woman for sewing through labor! I also really like what you did with leaving one side undone.. it makes perfect sense and of course, saves money and time! very cute, and yes, it does make me want to tackle those anthro shower curtains! Oh, that's super cute! I'd love to make a shower curtain version but it would probably be to heavy for my tension rod. this is so so pretty emily. and the shots of it on the crib are just so amazing. Did you make the sheet too? pretty! Oh, and I remember sewing up my daughter's crib bumper while I was in labor, only I didn't know it at the time, she was born about 5 hours later. I got it from http://www.pinkcastlefabrics.com/ She has an amazing selection of solids! Thank you! Our fabric store didnt have a great selection of blues. 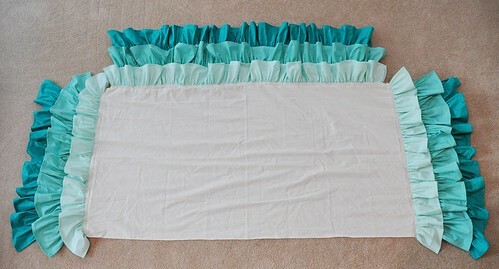 Super CUTE crib skirt, I love the colors!!! You did a great job. Kuddos!!! 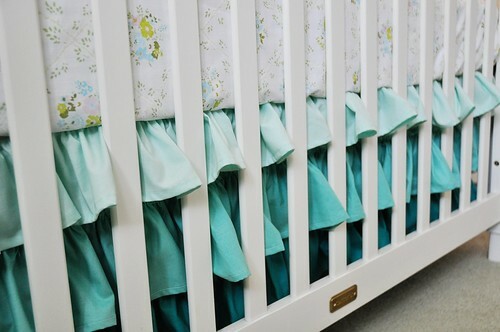 Super CUTE crib skirt, you did a great job, I love the colors! Kuddos! Thank You for sharing such a cute project, it inspires me. i loved your crib skirt so much, i decided to try making one myself. a lot of work, but the end result is adorable. omg! all ofthis while in labor! great job and thanks for sharing! I have a question about the construction. How are the bottom two ruffle tiers attached? Are they sewn onto the panel or to the top tier? I love the colors. 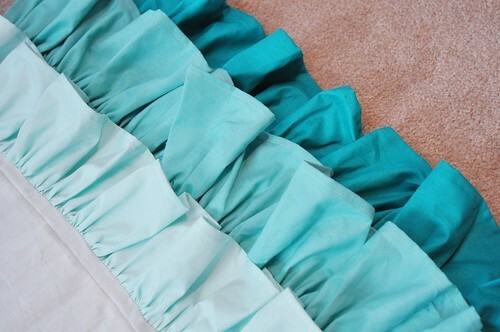 I found your post on pinterest and am getting ready to start my own ruffled crib skirt for our daughter's crib. I have 3 weeks left until my due date and have been procrastinating. Hopefully, she'll come after I finish it although I may end up laboring and sewing at the same time. Just wow.. amazing perfect tutorial..
LOVE! Did you cut these out the length of your yard of fabric?? 6"x 36" and then just sew together to create the full length needed? Yes, one yard per color should be fine. I did just what Amy S. described by cutting the yard into 6" strips then sewing the short ends together to form one long strip that I gathered. You don't even notice the seams once it's all ruffled! My first sewing project....Just finished the front panel & put it on the crib and I'm so excited!!! Thank you so much!!! How did you attach the bottom two ruffles ? I want to make one tomorrow for my little one and can't figure out how you did that part . Thanks in advance! The bottom two layers are sewn directly to the panel. I sewed the first layer to the very top, then marked two more lines - each about 5 inches down from the previous ruffle tier, and sewed them right onto the line. Hope that helps! Great Tutorial.. Just wondering did you make the crib sheet and if so where did you get your fabric? Its beautiful! 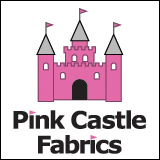 You can email Brenda who owns Pink Castle Fabrics - I think she knows which fabrics were used! Very Cute! 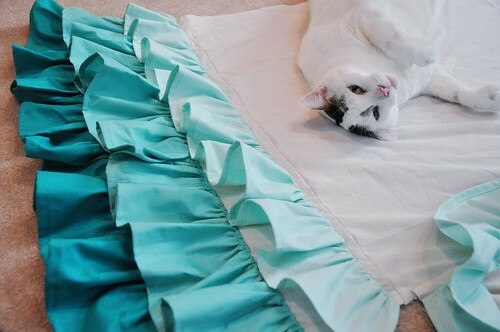 I am confused how you sewed the top ruffle on the bed skirt. Could you please explain further? 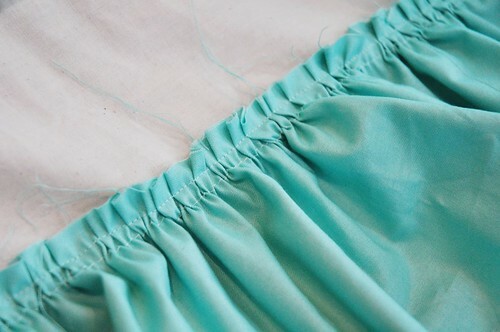 For instance did you fold the raw edge under and then sew it to the side panels? Or did you sew it to the flat top panel and then attach the side panel so the raw edge would be hidden? Why am I so lost on wrong sides facing for the top row? I've got all my rows gathered & ready to attach. Maybe it's my pregnant brain. Anyone have pics of the attached top row? I went back and reread that and I'm having a hard time making sense o what I was saying too, lol. So for the top strip, sew it so that the right sides are facing, and when you flip the ruffles down afterwards, the raw edge will be hidden. The top layer is the only one that I hid the raw edges, since the bottom two wont be seen under the above ruffled layers (I just sewed them directly onto the panel. I should really draw up a diagram one of these days with my sweet drawing skills. I hope that helped! Quilt is done & Skirt is done! Beautiful!! I pinned your pin and will be featuring you as the "pinterest pin of the day" on Sunday on www.momomma.com - Thanks!! I just used a regular foot, a regular needle (i think size 12), and I actually just sewed two lines of basting stitches and gathered the ruffles by hand. I do love your crib skirt and that is what first attracted me to your blog... but my question for you is about your crib! Do you know the name of it? I'd love to find one like it. Thanks! My daughter-in-law loves this crib skirt and I am making this for my newest grandaughter. What are the dimensions on the panels that you attach the ruffles to? Hi. I am making a tiered crib skirt for a friend of mine. What did you use for the deck? Muslin or something else? And how much of it do I need? Hi! I'm making this for my daughter (we both love it). 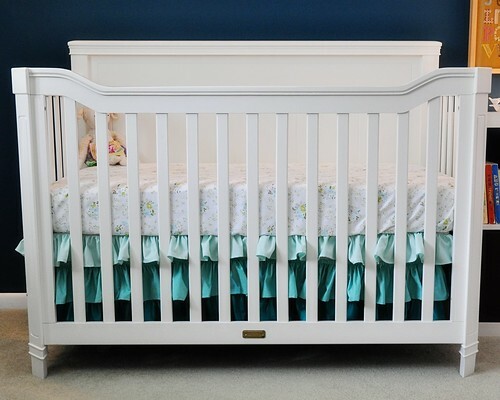 What size piece of fabric did you use to attach the ruffles to (to end up with the proper final 28" by 52" crib size deck)? I used a piece that was 29x53" and just sewed each side panel to the deck with a 1/2" seam. Good luck! I really love your crib! Could you tell me the brand and model?? It's by Carter's, but I can't remember the model. We got it a little over 4 years ago! How much fabric did you use in total for this project?